The number of individuals served grows each year in keeping with increased needs. 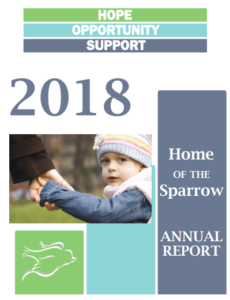 In 2011, HOS programs served 105 individuals; in 2012, in 2014, that number was 224 women and children; and during the 2018 fiscal year, Home of the Sparrow served 451 women & children. • RRH served 24 women and 51 children. • The Sparrow’s Nest Thrift Stores gave 850,000 lbs. of clothing and 725,000 lbs. of hard goods to recyclers.